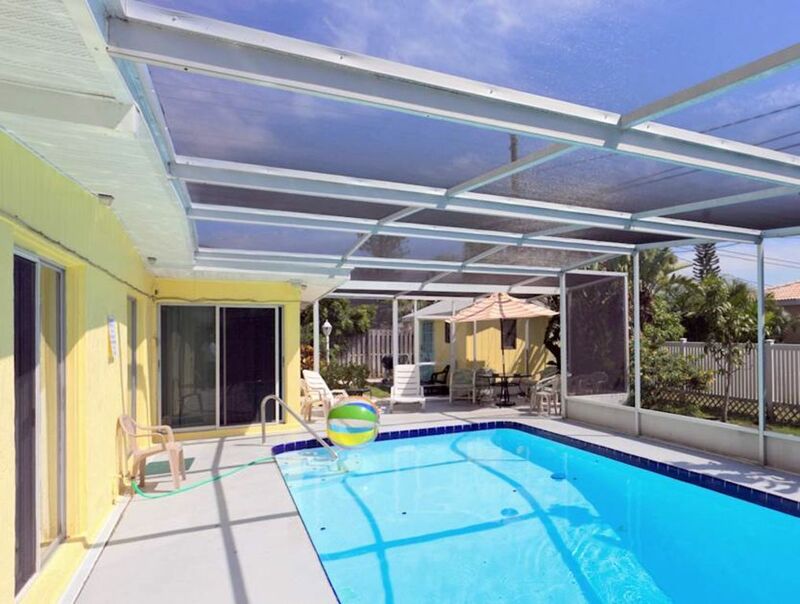 A family reunion or several families of friends and their pets can stay together in the spacious accommodations of Villas Mansion in Venice, Florida. There’s plenty of room for all. You’ll be just three blocks from the beach and also close to Venice dog beach, Brohard Paw Park. But, you may not want to leave Villas Mansion at all because you have a wonderful heated pool right at your home with plenty of chairs where you and your group can soak up the sun. Drive up to Villas Mansion and you’ll find plenty of off-street parking for your cars. The bright yellow paint and turquoise door will immediately put you in a party mood, and you’ll find everything you need inside to have a good time. Your mid-century modern vacation home is spacious with vaulted ceilings and plenty of comfortable furniture for a large group. You also have a large flat-screen TV with cable and a DVD player. After a day of playing on the beach or golfing, it will feel good to relax on the comfortable couches and watch a favorite movie with your friends. There’s also a CD player so you can fill Villas Mansion with your favorite tunes and set a mood for your vacation party. You also have free Wi-Fi within Villas Mansion, which makes it easy to check out websites for area attractions and email friends back home. The real fun is waiting outdoors in your screened lanai. It’s like an outdoor living room where you can play all sorts of water games in the pool or enjoy a glass of soda around the patio table. There’s also an air-conditioned pool house where you’ll find a bar, small TV, table, chair, and couch. It’s a great place to slip away and watch a ballgame. While you’re staying at Villas Mansion, you’ll want to enjoy a meal at Sharky’s on the Pier. Just a 15-minute walk from your vacation home, it offers live music at night. You’ll also want to stroll down to the Venice Pier and perhaps do some fishing. Did you know that Venice, Florida is the Shark Tooth Capital of the World? Take some time to look over the beaches and find a shark tooth souvenir. With a large group, you’ll probably want to dine in on many evenings. The Villas Mansion kitchen is well equipped with everything you need to prepare your favorite recipes. Make one trip to the nearby grocery and you’ll be all set for your entire stay. You can serve eight around your dining room table and another four in the nearby breakfast table. After a day of exploring Venice with its pink, Italian Renaissance buildings, Mediterranean-style shops, and date palms, you’ll be ready to relax in your bedroom’s king-sized bed. There’s a TV in case you want to watch a favorite program and a futon where a couple of young children traveling with you can bed down. The second bedroom also includes a king-sized bed and a futon to provide sleeping space for another family. This room also has a wall-mounted TV and a ceiling fan to stir evening breezes. The third bedroom features two queen-sized beds, a TV, and sliding glass door access to the pool area. Guests may enjoy slipping out for a moonlight swim or evening cocktail under the stars. The bonus room includes a queen-sized sofa sleeper, wall-mounted TV, and sliding glass door access to the pool area. There are three bathrooms within Villas Mansion. Each has a standing shower and one has a bathtub to accommodate small children. You also have a washer and dryer within your vacation home. No need to bring massive amounts of clothes. You can always toss in a load of wash and get back to enjoying the pleasures of Venice and the surrounding area. Plan your next family reunion or friends getaway at Villas Mansion. It’s a home built for fun, camaraderie, and making memories. Book your preferred vacation dates today!